Kinjal Darukhanawala’s, debut novel Emotional Hangover, is a refreshing read for the chick-it genre that is already resonating positively amongst Indian teenagers and young adults. In an exclusive chat for Indiaplaza.com with Literary Analyst, Kirtana Krishnan, Kinjal tells us about life, love and pasta! Kirtana.K - Tell us about yourself and what motivated you to write Emotional Hangover? Kinjal.D- I am a dreamer and a passionate person and writing is the most liberating thing I have ever experienced in my life. It feeds my soul and makes me whole. The human drama amuses and intrigues me time and again and it is safe to say that Emotional Hangover is the by-product of all the human drama I have witnessed in my life. When I read Emotional Hangover today, it is almost as if my alter-ego wrote it in a parallel universe. In short, the book took on its own path along the way and the words just poured out. K.K-The book deals with psychological issues. What research went into writing about them? K.D-I have been told many times by my elders and well-wishers that no good can come out of over-thinking and over-analyzing. But my curiosity about how people think and function encouraged me to pen this book. After reading life altering books like A New Earth, I’m Ok, You’re Ok and The Book of Nothing, I realized that all answers are within us and I wanted to depict that in a fun and light hearted story, which everyone can connect with. K.K- How did your life experiences contribute towards this book? K.D- I am dramatic, I am obsessive, I am moody, I am oversensitive, I am foolish, I am sincere, I am hardworking, I am spiritual, I am lazy and I am hot-tempered, just like the characters of Emotional Hangover. So there are bits and pieces of KinjalDarukhanawala in all the characters of the book. K.D-That is very flattering, thank you. On some level it would be very difficult, rather impossible to typecast this book under any category; be it chick-lit, rom-com, fiction or self-help. At the risk of sounding overambitious and full of myself, I would like to confess that I want people from all over the world and not just India to connect with the book. K.K-You seem to be a person very much in touch with your inner woman…and a nice person no less. K.D-That’s a great compliment. I live by the philosophy – Thoughts Become Things and no, that does not mean that I have no negative thoughts, it’s just that I prefer to choose good thoughts most of the time. K.K-Are you a spiritual person? K.K-Who are your favourite authors? K.D-Rhonda Byrne, Eckhart Tolle, OSHO, Danielle Steel, Jeffery Archer, Helen Fielding, Sophie Kinsella, Dale Carnegie, Louise Hay – they have all created history! K.K-What book are you currently reading? K.K-Indians are very emotional but are we good at managing those emotions? Do Indian parents ignore their children’s emotional development over their academic development- when the former is equally as important? K.D- I am so glad you brought this up. We as Indians have been conditioned to give a lot of importance to academics, religion and societal pressure. Somehow these always take precedence over spirituality, passion, love and kindness. What we “should” do has become so precious, that what we “want” - or even questioning ourselves about, what we want has almost become redundant. I think parents need to realize that children don’t come into the world to fulfil their incomplete dreams, but, to carve their own journey and at some point children need to learn to step out of the parents’ shadow and create their own individuality and value system. The education system too needs an overhaul. I think we all have spent endless hours mugging battle dates, war details, Kipps Apparatus and Pythagoras Theorem. While I have nothing against history, chemistry or maths, I really think the curriculum should include subjects like self-image, inferiority complex, peer pressure and the like. K.K-On a lighter note, tell us about your all time favourite vegetarian dish. K.D- Give me pasta in any form and with any sauce – pesto, cheese, arrabiata, aglio-e-olio and I will smile from ear to ear. It’s always a great feeling when you get to read a Fiction story which you can relate to. A Great read for all men to know how a woman thinks and for all women who experience emotional hangovers in the many roles they play daily. Kinjal has captured a very unique view of various relationships a woman experiences in the different years of life and grips your attention through out the read. 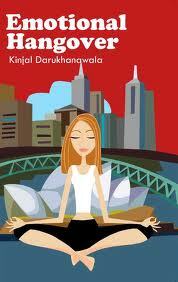 I thouroughly enjoyed every page of the book and am looking forward to read more of kinjal's books soon. Hey Kinjal! From whatever little that I know u ,U have summed up yourself completely in this interview and in the book.And trust me ...its a very sensitive,yet realistic person one would feel u are.Not to mention, a very intelligent one also.Overall a person whom every person on earth would easily connect to.